Winter 2017 – Anchorline By Roger Muller, Jr.
Read the article in Anchorline, The Grady-White Owner’s Newsletter. Read the article on HobokenGirl.com. Nov 21, 2017 – Roger Muller (left) sits down with WFMU’s John Trelease to discuss insurance, Hoboken and three generations of Mullers. Listen to the interview from WFMU. Sept 26, 2017 – Hoboken Internet Radio speaks with Roger Muller about what he needs and wants from a new administration. Listen to the Podcast on Hoboken Internet Radio. July 13, 2017 – Muller Insurance’s work, history and impact on the community was profiled in the latest edition of 07030 Hoboken. The magazine interviewed current co-owner Roger Muller Jr. on how his insurance company has evolved since its inception over a century ago. View the article from 07030 Hoboken. July 17, 2015 – The Visitor profiled Roger Muller Jr.’s visit to Panama to hunt for the dangerous yet tasty lionfish. Read the article on The Visitor. Nov 17, 2013 – Muller Insurance won the Hoboken Chamber of Commerce’s 2013 Uniquely Hoboken Award for its outstanding and ongoing client and community service. Co-Owners Roger Muller Jr. and sibling Erika Muller were on hand to accept the award at the Chamber’s annual presentation. Check out the full story in the Hudson Reporter. Dec 30, 2012 – Erika Muller and Roger Muller Jr were profiled in Hudson Reporter on the benefits of family and, in particular, brother-and-sister run businesses. Read the article on Hudson Reporter. Aug 31, 2011 – Muller Insurance comes to the rescue of hundreds of local residents hit by flooding. View the article from the Jersey Journal. Nov 27, 2011 – Undercurrent dives into a story on Roger Muller Jr. taking daughters Kelsey and Taylor on a Shark-diving vacation near Mexico’s Guadalupe Island. Read about the trip on undercurrent. May 17, 2011 – The City of Hoboken has named Tenth and Washington Streets “John Muller Way” in honor of the Muller Insurance founder. John Muller established his insurance agency in 1906, making it the longest continually operating business in Hoboken. Check out the article on hoboken411.com. 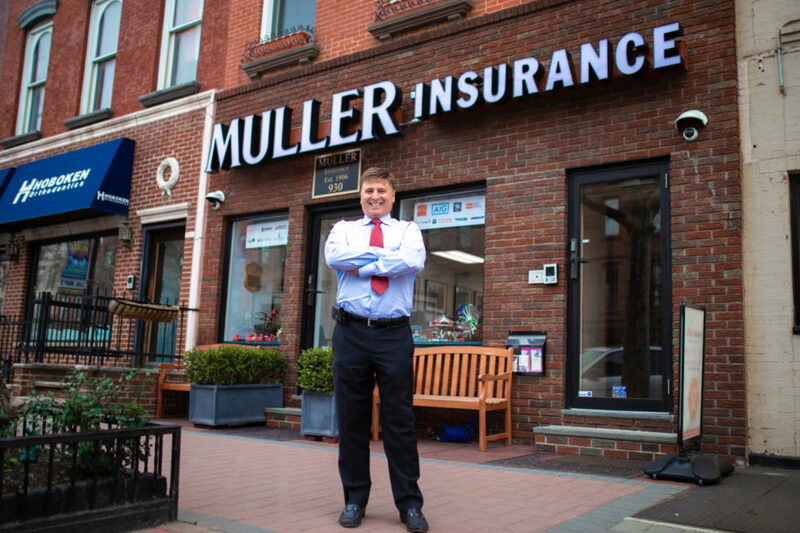 June 11, 2018 – Lynn Hazan from chicpeaJC recently visited the Muller Insurance office in Hoboken for a chat with Roger Muller.